Part Skim Mozzarella Cheese Polly-O Part Skim Mozzarella Cheese is made with premium quality natural ingredients using the classic Italian technique. Creamy and delicious, this mozzarella cheese will add a little taste of Italy to every bite. 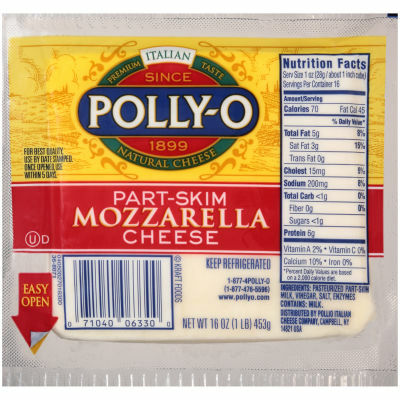 Cheesy Goodness Transform your everyday meals into an indulgent experience with Polly-O Mozzarella Cheese. Add it to salads, sandwiches, pasta, casseroles and more for that mouth-watering cheesy goodness you can’t get enough of. Serving size 1 oz / 28g (about 1 inch cube).